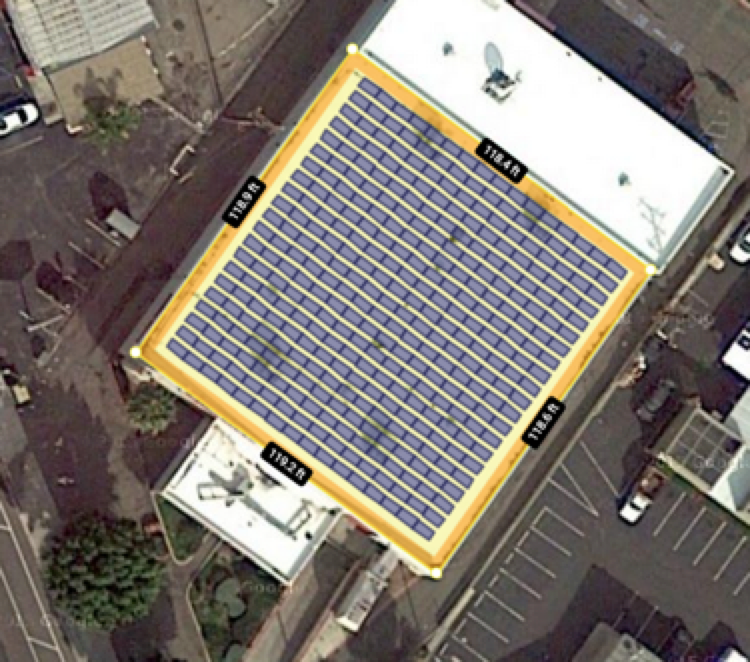 Create a Field Segment by clicking points to outline the rooftop. Then select the module you plan to use – typically commercial projects use 72-cell modules (nameplate power of between 280Wp-320Wp). Set the orientation (azimuth) of the array to be in-line with the building: right-click on the “front” edge of the roof, and select “Set Azimuth to ___”. The modules will automatically align to face that building edge. There are a number of methods for setting the spacing between rows. The most common approach is to set the row spacing based on a zero-tolerance shading rule from 10am to 2pm on the winter solstice. Do this automatically from the “Time of Day” link in the Designer. Use the “Setback” parameter to define a perimeter setback around the array. Most codes require either a 4 foot or 6 foot setback, depending on the size of the building. In areas with significant snowfall, the perimeter requirements may be as high as 10 feet. As necessary, define setbacks around objects. For larger objects, such as HVAC units or skylights, typical setback distances are ~4 feet. For smaller objects, smaller setbacks (~2 feet) are more common. If the obstruction has a height, enter that next to the Keepout in the menu. You will have two options for adjusting the array based on the shadows from these Keepouts: either remove modules that are shaded from 10am to 2pm on the winter solstice (the default), or remove modules based on their shading percentage in the Advanced - Shading menu tab. Finally, add in walkways across both center-lines of the building – or, for larger buildings, draw these every 150’. 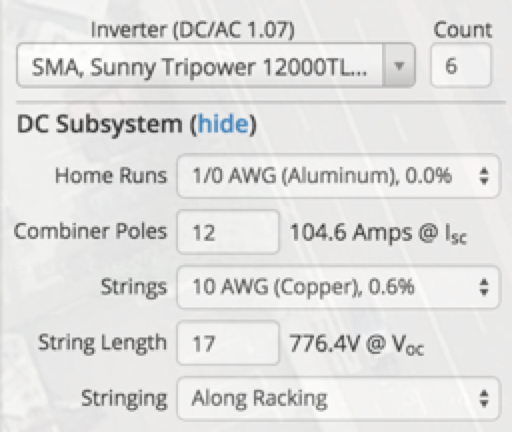 Select a string inverter, and HelioScope will automatically set an inverter quantity that results in a DC-to-AC ratio of approximately 1.25. Move the inverters to the locations where they will be mounted, and the wire content will be adjusted automatically. 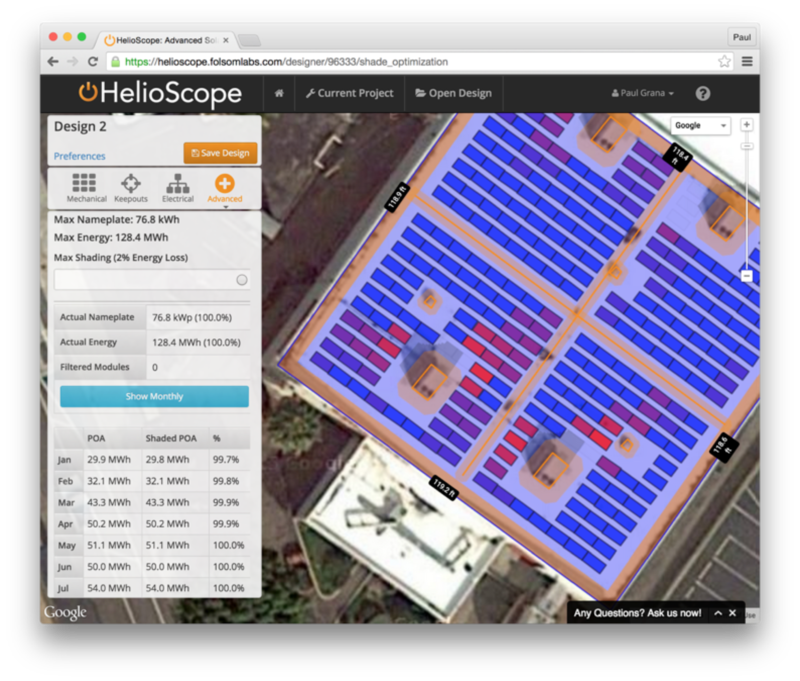 If you plan to use microinverters, simply select them, and HelioScope will automatically configure the AC array accordingly. In this case, move the red icon to the point of grid interconnection. With the inverters and/or grid connection point set, confirm the voltage drop next to the conductors (see the example below). Most engineers strive to keep the voltage drop values below 2% for both the DC and AC systems. The weather file defines how much sunlight (and therefore how much energy yield) an array will have. Use the “Weather” menu of the Condition Set to choose a weather file. Many engineers will use the nearest TMY2 or TMY3 file, unless they are too far from the location of the array. Under the “Soiling” menu of the Condition Set, choose the soiling/snow loss rates, either yearly or monthly. Arrays near coastline, highways, or deserts can often have higher soiling rates. And arrays in snowy areas can have significantly greater losses from snow cover in the winter months.